A client of mine needed to move a Data folder from one of there servers, to another. Easy enough right? Just Copy the data off ahead of time, like a seed copy, then on the day of the switchover just do another, to copy the changes. Robocopy is great for that and a great resource for Robocopy is here, stop sharing the source and start sharing the destination. The complicating factor here, was that they access this folder via a mapped drive. Ordinarily not an issue, you can simply disconnect the drive, and remap to the new server. Except – you cannot do this if your mapped drive is showing disconnected. At this client, all the mappings to this particular folder were showing disconnected – however the drive still worked. It was one of those issues we looked at and thought, huh, that is weird, oh well it still works so we will look at that tomorrow. Tomorrow being that 8th day in the week. So here i was on Sunday evening, thinking ah, i hadn’t thought of that – how can i get this drive switchover completed with minimal disruption to the users? Well firstly i had to solve the problem of not being able to remove the drive letter. If you search on the internet you can find a large amount of posts from people suffering from this issue, occurring on both XP and Vista, and probably Win 7 as well. Things like net use x: /delete or net use * /delete, were not working, and neither was simply right clicking the drive and saying disconnect. Well, this client did indeed use Symantec, so, cause identified, move on to the solution. Quite simply, a registry edit. So now we have the solution, how to roll this out to 20 client machines with the least effort? 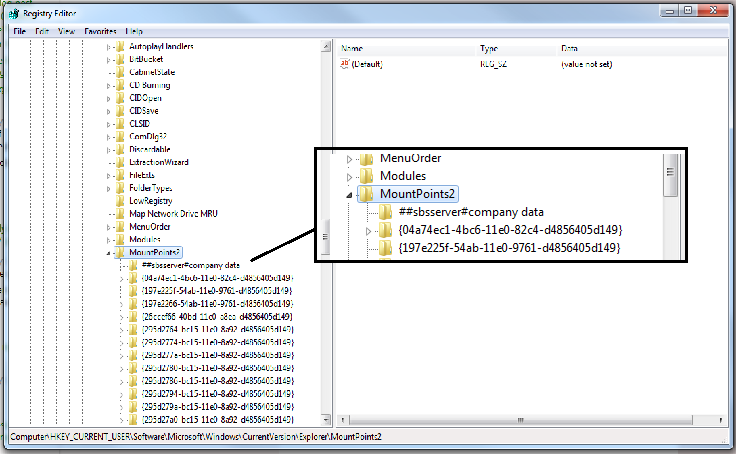 Reading through this article we learn about how to use a .REG file to modify the registry and how to use a .REG file in conjunction with a BAT file. You may be way ahead of me now, but for those that aren’t..
First, i exported the registry key and saved it. You can do that by Right Clicking the key, and clicking Export. Now, open your file in notepad. 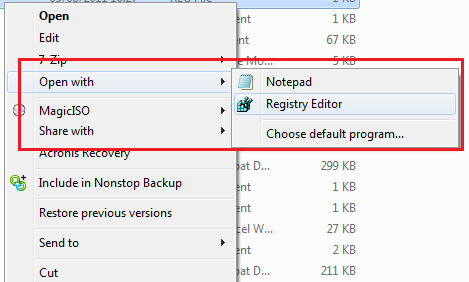 If you find this just opens the file in Notepad again, right click the file, choose ‘open with’ and then choose Registry Editor. Either way, you should be shown this prompt.. It may vary slightly from OS to OS, but essentially it is the same warning. You want to say YES at this point. When you click Yes, the entries defined inside our .REG file are removed from the Registry. A reboot of the PC and the ‘Disconnected Drive’ is now gone! Ok, i know what your thinking – how does this help us with 20 computers? Get 20 users to run it? NO! As i mentioned above, the article http://support.microsoft.com/kb/310516 , not only shows us how to delete entries from the registry with a .REG file, it also tells us how to run .REG files silently within a BAT file. So what i did was to put my .REG file on a server share that was open to all users. I then wrote a BAT file to call that .REG and run it silently. To save this as a ‘BAT’ file, choose file, then save as, set to all files, and type your file name. I then added this as a logon script using a Group Policy Object. I am not going to cover how to setup a GPO as it is a little beyond the scope of this post. So come Monday morning, all users logged on and had their Drive deleted, they were all told to reboot after logon. I had also written a new BAT file to map their drive to the new location, and how many support calls did i get? ZERO! i’m still having the same problem with mapped drives. in the registry there are no entries for mapped drives. what now? I would search the entire registry for any drive mappings. You can get rid of orphaned disconnected network letters by “resetting” the desktop.” That’s easily accomplished by going into taskmgr and deleting all instances of “explorer” Voila–no more desktop! To bring it back you merely need to explore a drive –But HOW when there’s no drive icons– One easy way is open taskmgr again, Go “FILE/New Task/Run/%temp%”. That will cause the temp directory to come into focus and will essentially reset your desktop–WITHOUT the orphaned Network references. Fight Fire with Fire. I’ve seen folks looking for a solution to this BUG for years. To disconnect the drives, simply end the explorer process and restart it again vis Task Manager. Worked for my on Server 2008 RC2 after rebooting. I have a script that will map roughly 10 drives. Running script as administrator says successful but no drives show up. If I run it without administrator, they map. Strange but at this point, I’m done questioning things. Thanks for the solution. What is your script written in? I believe that GP Preferences is the preferred way to do drive maps these days. have a suggestion, that i think alot of people overlooked. It took me a while to find it.Since its a server i was having issues with. i looked at users, ctl – alt -del. Then i noticed another login under users. Same user name, logged off, but still there. i then logged them off again, using the option, logoff, suddenly my mapped drives are fine. Shows amount of storage, used, etc. So looks like this solved my issue with losing mapped drives. Hope this helps others still scratching there heads. Finally … simply killing and restarting explorer.exe … did the job! Thanks a lot. Nice post. Worked like a charm!